Samphire is a fabulous vegetable. It grows by the sea and is one of the great tastes of British summertime. But veggies need a change of scene, just like the rest of us. 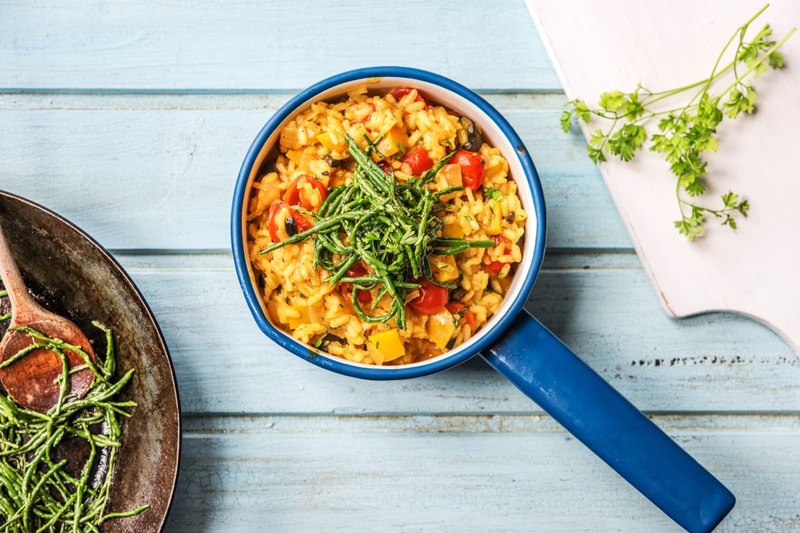 So we're sending it on holiday to Spain as part of this delicious paella-style rice! The trick to a great paella is not to stir too much, so it develops a crispy crust at the bottom. The Spanish call this the 'socarrat'. It's considered the best bit! Preheat your oven to 200°C. Halve, peel and chop the onion into roughly 1cm pieces. 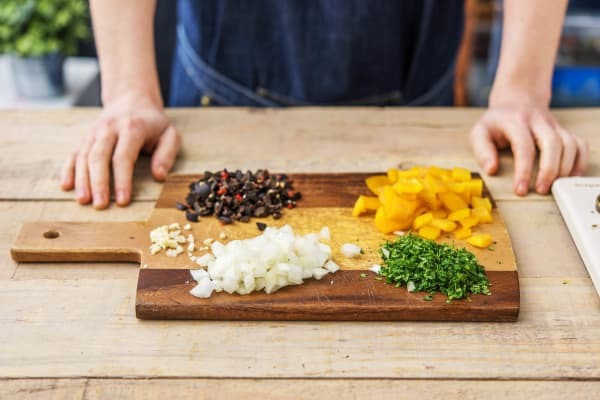 Halve, then remove the core from the yellow pepper and slice into roughly 1cm pieces. Peel and grate the garlic (or use a garlic press). Roughly chop the olives and the chervil. 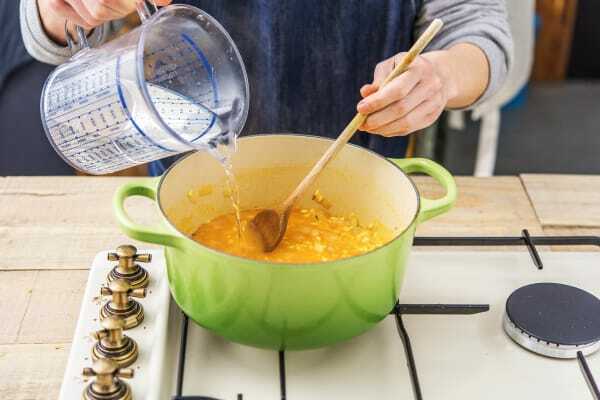 Add a drizzle of oil to a large saucepan on medium heat. Fry the onion until soft, 5 mins. Add the yellow pepper, season with salt and black pepper and turn up the heat slightly. Fry until slightly browned, 5 mins. Add the garlic, smoked paprika and turmeric. Cook for 1 minute more. Add the arborio rice to the pan and stir to coat it in the spices and oil. Add the water (amount specified in the ingredient list) and the vegetable stock pot. Bring to a gentle simmer. Cook until all the liquid has been absorbed and the rice is 'al dente', 15-20 mins. TIP: 'Al dente' simply means the rice is cooked through but has a tiny bit of firmness left in the middle. 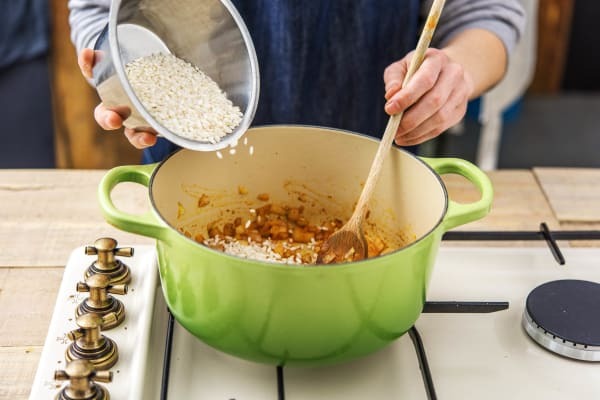 If all the liquid has been absorbed before the rice is cooked, just add a splash more water and keep cooking. Meanwhile, cut the cherry tomatoes in half through the equator. Put them on a lined baking tray, drizzle on some olive oil and season with a pinch of salt and a good grind of black pepper. Roast on the top shelf of your oven for 10-15 mins. Once cooked, remove and set aside. Five mins before the end of the rice's cooking time, rinse the samphire in a colander under running water. 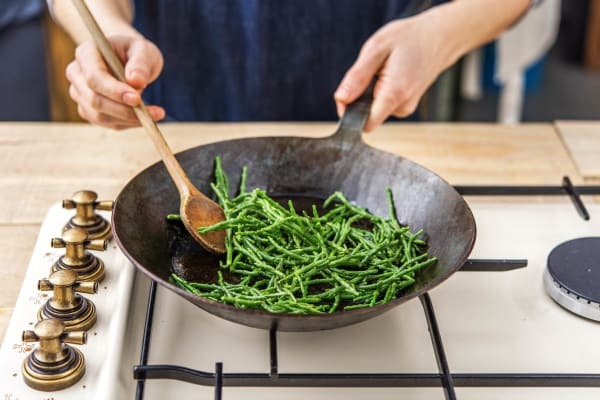 Put a frying pan on medium heat, add a drizzle of oil and the samphire (don't worry if it's still a bit wet, this will help it cook). Grind over some black pepper and cook the samphire for 3 mins, then remove from the heat. It should soften but retain some bite. Once the rice is cooked, turn off the heat. 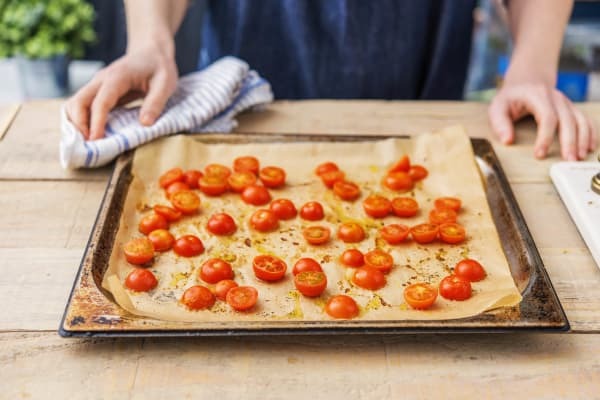 Squeeze over a little lemon juice and add in the olives, roasted tomatoes and three-quarters of the chervil. 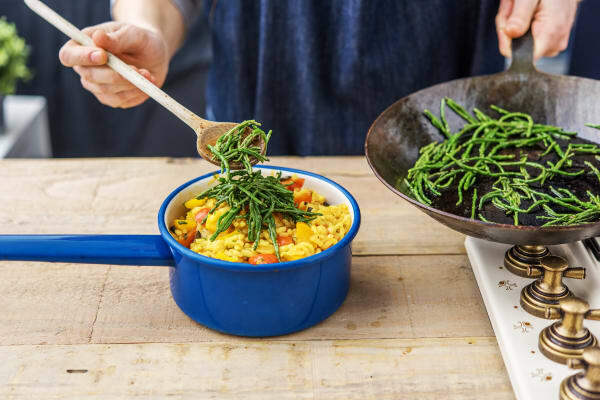 Stir everything together and serve in bowls with the samphire on top. Finish with a sprinkling of the remaining chervil. Cut the rest of the lemon into wedges and serve alongside for squeezing over at the table. ¡Buen provecho!